On Monday afternoon at dismissal, one of my parents gave me a thoughtful gift. The gift? Biltong – a South African snack of lean meat that has been cut into strips then dried and salted. This snack is not easily found here. What I have bought previously has not been salted and spiced correctly. Beef jerky (the American equivalent) does not compare. The packet I received on Monday was perfectly cured and brought to my mouth a taste of home. You may be asking yourself why the mother of my student would give me such a gift. My student’s father grew up in South Africa, Johannesburg in a suburb that I know well. We have reminisced together about places and foods we had once eaten. He mentioned once that he had found the perfect tasting biltong at a butchery not far from where we live. He must have relayed our conversation tto his partner as the next packet his wife bought (who is not from South Africa), she passed onto me. This week I am grateful for the thoughtfulness and kindness of a woman who understands what it is like to miss the tastes from your home country. I am thankful to have tasted a little of my past and to have savoured a snack I had not eaten and enjoyed for five years. It certainly was. And so unexpected. What a pleasant surprise – especially a taste from home. Meanwhile, I’m ever grateful for the many good people I’ve encountered in the ballroom dance community. It was Frank. And I showed it – I could not help but give her a hug. I remember when I used to dance socially- many of the people I danced with became good friends. I love biltong too and can’t imagine going for 5 years without some! Have you tried to make your own? It’s really easy! The next time I visit South Africa my plan was to buy the container to dry the meat in. Unless you know how to make one? I would love to figure out how to make it. I used to make my own biltong long before the small dehydrators were made. I used to make mine in winter in a well aerated room. If you are concerned about hygiene, you can enclose the meat in large brown paper packets and then peep inside now and again to see how it’s doing. Old Chinese people dry fish this way, so it’s an age old method. That is a good idea – thanks for the tip. 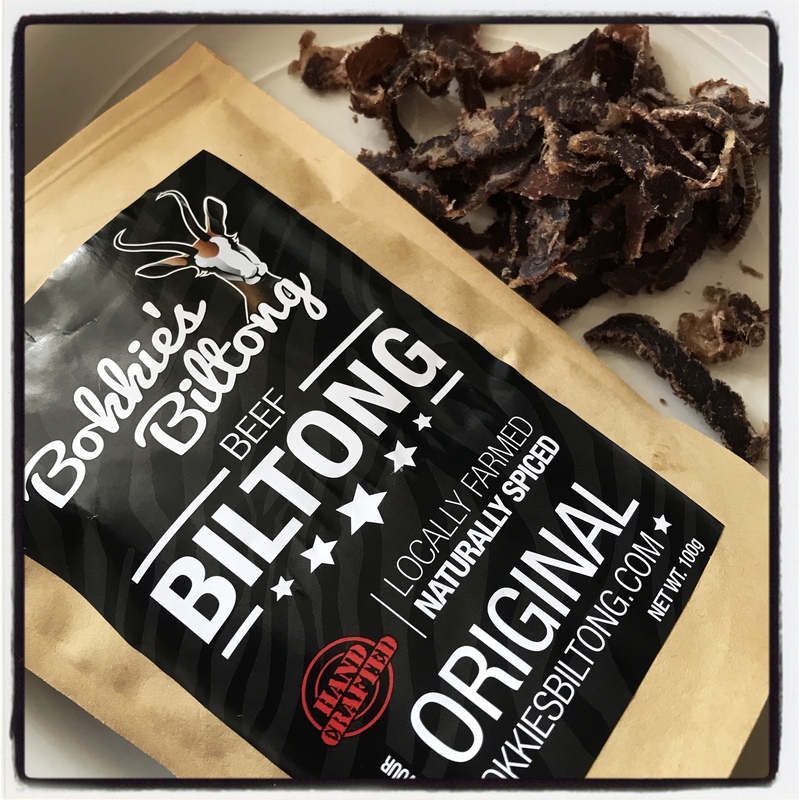 Do you have a favourite biltong recipe to use? I haven’t made my own biltong in a long while and my recipe was not traditional. I remember using vinegar, brandy, soya sauce, sugar, salt, bicarb and crushed black peppercorns. Below is a more traditional recipe for home made biltong. Using a glass or steel container for marinating is important. Slice the meat, with the grain into 1cm thick x 2cm wide strips and about 20cm in length and rub thoroughly with the vinegar. Mix the salt, sugar, crushed coriander seeds, bicarbarbonate of soda, black pepper and paprika together in a bowl to form a rubbing mixture. Rub the spice mixture into the pieces of meat. Take a glass or stainless steel container and layer the meat, making sure the the thicker pieces are at the bottom. Cover the container with cling film and refrigerate for about 12 hrs mixing every couple of hours so that the meat flavours evenly. Hang up to dry in a well ventilated spot. Biltong Machines for home use work very well. Drying time is about 4-5 days, depending on the weather, and your personal preference.